I just picked up two shades from this collection, Leggy Legend and Frock ‘n Roll. Today’s review is for the former. 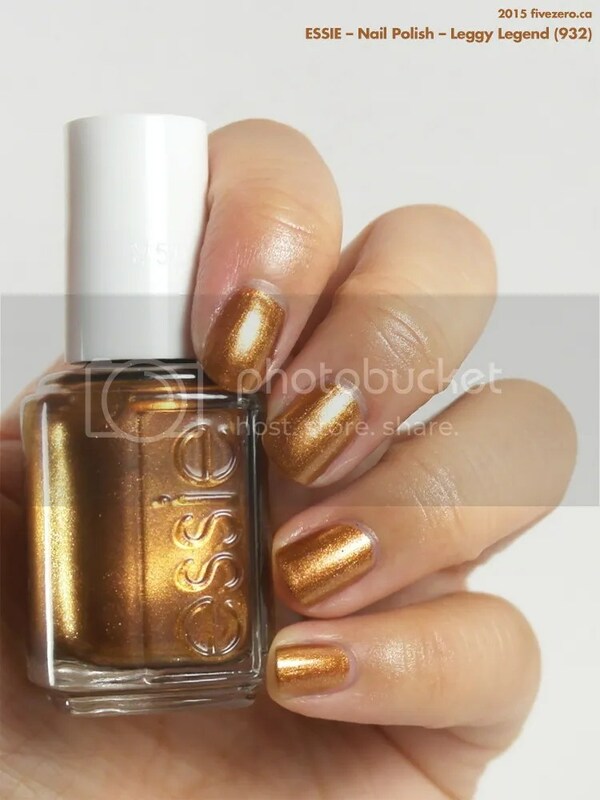 Essie calls Leggy Legend (932) “an alloyed bronze bombshell”. It’s a super gold-toned, foxy bronze metallic shimmer that stops just short of being frosty. I myself am quite warm-toned, and even quite tanned this summer, but find this a little overwhelmingly bronzed. I feel like unless you have a warm, deep skintone (in which case Leggy Legend will look amazing), this is going to give you lobster hands (i.e., make your fingers look really pink). However, this polish is also crazy glam, so maybe you’ll just want to rock it, anyway. I know I will! If you love golds and bronzes, you’ll want this one, for sure. Application was very smooth and not too streaky at all, even with the highly shimmery, metallic finish. Two coats gives full opacity. Love this! Looks perfect for the festive season! Definitely! So much more interesting than the usual pale golds/champagnes, too. I want this, yet I don’t want it. I want it mostly for how awesome this formula looks, but I know I’ll apply it once and not love it on me. The Essie Fall collection looks AMAZING. Frock ‘n Roll is the one I want. I almost wore Frock ‘n Roll last night! Hope I’ll have a swatch up for tomorrow 🙂 I’ve really liked the last few major Essie collections…looks like the RM connection has been fruitful so far! So glad it looks great on you! 😀 Thanks for letting me know. This looks absolutely gorgeous! I ordered this from Ulta along with Bell Bottom Blues and Frock N Roll . . . and then I picked up With The Band when I was at Walgreen’s! I cannot wait to try this one – it screams 1970’s and David Bowie to me! Obsessed!